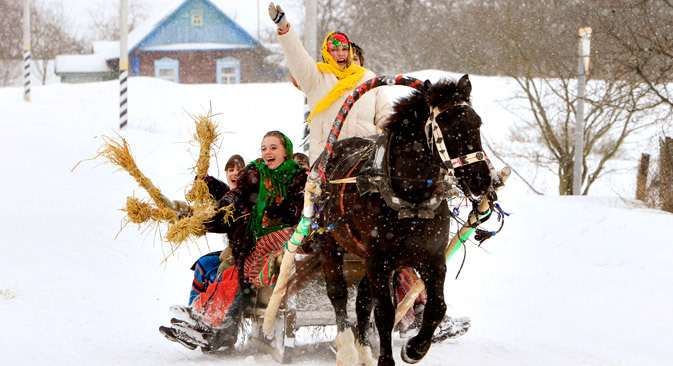 Eleven years ago, when I first celebrated Maslenitsa or Shrovetide, the Russian festival welcoming spring, I was excited about the fact that the long winter was finally on the wane and that warmer days lay ahead. When we burnt the effigy of the old man of winter, much the same way as it’s done in India the night before Holi, the temperature hovered around fifteen degrees below zero Celsius. It goes without say that there was plenty of snow, which looked well settled and not even close to melting. The snow stayed on for the next 2 months and before spring could really set in, it was already summer. The season is indeed a small sideshow ahead of the warmer months. Although Russians are not particularly fond of the rain, the way we are in India, there is a ritual that is similar to what many of us have enjoyed when the first monsoon rains sweep southern and western India in June. Children and the young at heart run outdoors to relish the first showers, regardless of how cold the rain is! In some parts of the Russian Far East, where one might not see rain until May, some people walk into the shower on the first of March and get wet with all their clothes on. In many parts of Russia, spring isn’t so much about green grass, chirping birds and rainfall. It represents a mindset more than anything else. Spring brings with it one of Russia’s most celebrated and colourful holidays: International Women’s Day. Flowers, chocolates and sparkling wines are in heavy demand for this holiday, not to mention more expensive gifts. Russia truly likes to celebrate its legendary beautiful women and I have seen people spending as much for their partners on this occasion as they would on a birthday or an anniversary. Men on the other hand get a hug or a kiss on the cheek on the occasion of Men’s Day, which was a few days ago! One thing that spring brings despite the cold is longer days. There are few greater pleasures of Russian life than leaving the workplace at a normal time and having hours of daylight to enjoy the evening. Spring tends to be gloomy, muddy and rainy, but the sprits are surely up since summer and the vacations are not far away. Students often complain that the weather is not conducive to studying and concentration and that they would much rather be out taking a walk and be on the lookout for potential partners. School children also can’t think about anything except the pending vacation. I personally had a tough time negotiating spring in Sakhalin. There was always the imminent danger of a pointy and large icicle falling off a building and injuring someone. Such reports are still ever so common in the media. Then there was the late-spring phenomenon of cold nights and relatively warm days, which led to a unique problem: The ice would melt during the day and one risked getting splashed by a speeding vehicle on the way to work. The water would refreeze at night just so that the sidewalks become slippery again. Talk about insult and injury! None the less, the inevitability of summer and the warmer months make the spring transition all worthwhile. For those who are not enthusiasts of winter sports, it’s a great time to take the bicycle and the running shoes out of the closet and get active. The best part of the season is the May holidays in the country, which have been given a fresh lease of life. Russia is at its beautiful best around Victory Day, when the snow has melted in most cities, the spring cleaning done and the green grass is shining. In the Far East, it’s around that time that birds come back from the south. Despite the mixed blessings a Russian spring brings, it is a great time for new and fresh beginnings and set out and enjoy parts of the great outdoors that are inaccessible in the cold season. May the warm weather set in firmly in Russia and as the Indian plains get ready for summer, may some of that cold weather head southwards from the Urals.